I have had my nails bare for about 3 weeks and I just couldn't stand it no more. Having no polish on my toe nails was driving me insane. I didn't want to spend a fortune and even though having MUA Nail Polishes before for a Pound (£1) I just didn't really care. I went into my local Superdrug on the look out for the shade BOLD BLUE and apparently it's been out of stock for awhile and even online and on the MUA online store so I did have another colour as a backup if I didn't spot it and it was this lovely pink shade called NATURAL DAYS (£1). 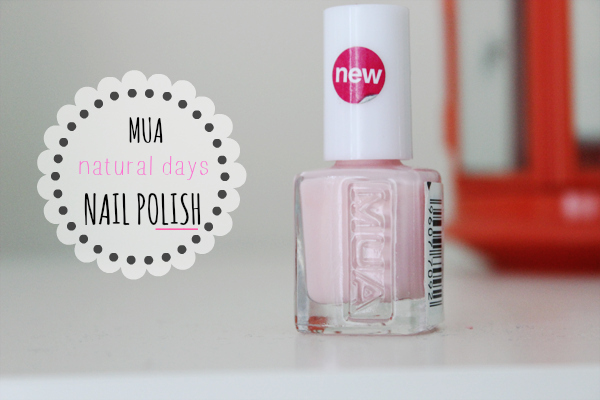 I am not used to such success in Nail Polishes and just for £1 I was really pleased with the Chip-Proof formula from these NEW MUA Nail Polishes. You really can't justify price and quality when it comes to beauty anymore. It's not about the price that makes it great quality ( you can easily be paying for the name of the brand ) but a nail polish like this for just a Quid has just left me wanting to stock up on more of their new shades and try other brands to test out the quality. HAVE YOU TRIED THEIR NAIL POLISHES BEFORE? ANY NAIL POLISH BRAND YOU RECOMMEND? SHARE AND LET ME KNOW IN THE COMMENTS BELOW! such a pretty colour! i cant believe i dont own any mua polishes! This looks like such a pretty colour - I must get my hands on it! I only own one MUA nail polish so far (Amaretto Crush) and have been really impressed with the quality of that too! !